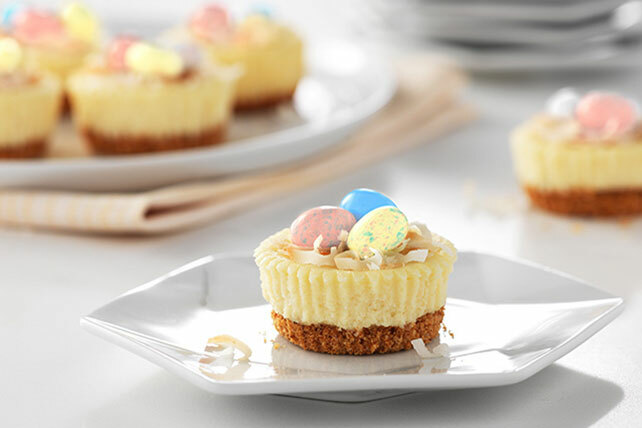 There's only one thing that can pry their attention away from the chocolate in the Easter basket: one of these PHILADELPHIA Easter Mini Cheesecakes! Mix graham crumbs, 2 Tbsp. sugar and butter; press onto bottoms of 18 paper-lined muffin cups. Top each cheesecake with 1 Tbsp. coconut; shape to resemble bird's nest. Fill with malted milk eggs. Enjoy your favorite holiday foods while keeping portion size in mind. One serving of PHILADELPHIA Easter Mini Cheesecakes is one.